President Paul Biya of Cameroon and Gilles Thibault, French Ambassador to Cameroon. 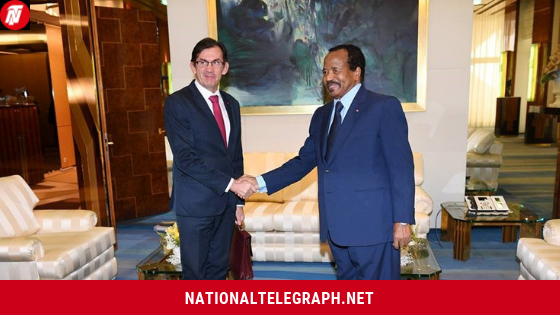 Paul Biya, 86, President of Cameroon, a Central African country has received, April 11, 2019, the Ambassador of France to Cameroon, National Telegraph has gathered. Gilles Thibault was received at the Unity Palace during a two-hour long discussion in which he reassured President Paul Biya of France’s willingness to continuously support Cameroon in development and security. The two men talked especially on urban development and trade. In the high points of the discussion, the Ambassador said France has particular interest to improve the living conditions of city dwellers. According to information filed to National Telegraph, Ambassador Thibault said his country is always ready to the support Cameroon in maintaining peace and stability. Talking specifically on the high point of the agenda; urban development, the Ambassador said Bamenda, Bertoua and Garoua would soon be benefiting from the cooperation ties of both countries, citing Douala where wastewater collection channels have been constructed. The French Ambassador is the second foreign diplomat President Paul Biya is receiving in one week. Just recently, he granted an audience to the Swiss Ambassador to Cameroon, Pietro Lazzeri during which discussions centered on economic relations, immigration, development cooperation, and humanitarian aid. Previous Cameroon: Muea Police Station Makes Four Million From Arrestees In 24 Hours. Next Cameroon’s Secondary Education Minister Visits Home, School Of Murdered Douala Student. France should not be including Ambazonia towns in its plan with LRC. Ambazonia’s citizens abroad are loaded with cash and technological know-how that will be used in carrying out massive development projects of modern standards. LRC should get out.